This work is accompanied by letters from the Wildenstein Institute, Paris signed by Michèle Paret and dated 5 January 1984 and 22 January 2002, confirming that the work would be include in the Albert Marquet catalogue raisonné. The Wildenstein Plattner Institute have confirmed that the work will be included in the forthcoming Marquet digital catalogue raisonné. Marquet’s 'Porquerolles' embraces a new modernist style of painting based on simplicity of form and purity of colour. Marquet’s talent for painting the luminescence of light on water was extraordinary. The cool blue and grey tones, which are a constant thread in Marquet’s work, are emboldened by his swift and decisive brushstrokes. Uninterrupted by unnecessary detail, Marquet depicts the landscape through only its most significant features. Alongside friends and fellow students at the Atelier Moreau, Paris: Matisse, Rouault and Camoin, Marquet exhibited at the scandalous Salon d’Automne in 1905, where Fauvism was inadvertently formed. Marquet’s work was distinguished by a depth of colour, although he never let this define his paintings. 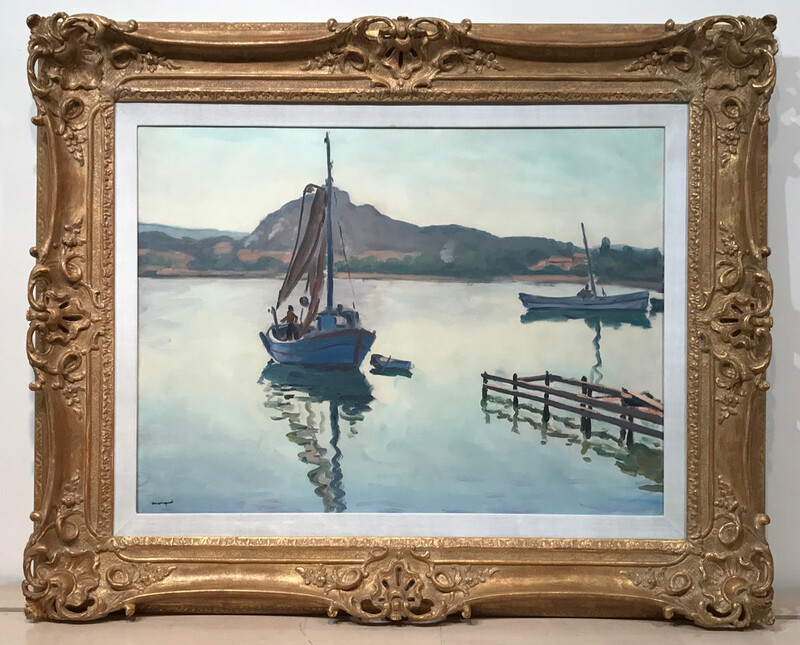 By 1938, when 'Porquerolles' was painted, the vivacity of Marquet’s earlier fauvist brushwork is replaced by his uniquely subtle and nuanced brushwork and colours. Marquet frequently travelled, painting the ports and water scenes of the landscapes he discovered. Water became a tool for abstraction, enabling him to develop his own intuitive minimalism. Having travelled through Stockholm, Amsterdam, Toulon, Paris and Cap Brun in 1938, it was the idyllic isle of Porquerolles that truly captured his imagination. Infatuated by the area, Marquet returned the following year with his family to paint another series of canvases. 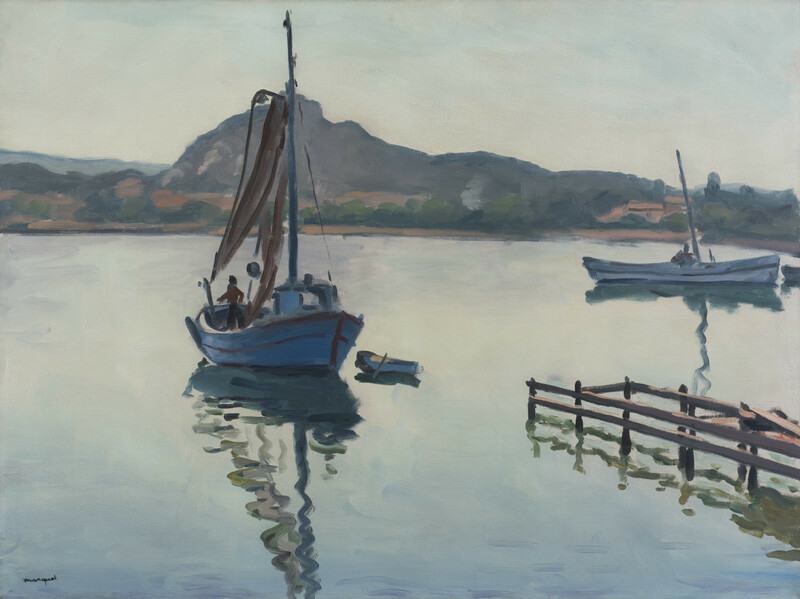 The jetty depicted in 'Porquerolles' was a recurring source of inspiration for the artist, and is seen in a number of his paintings, one of which is in the collection of the National Gallery of Ireland. Marquet’s works are held in multiple major international galleries such as Tate, The Hermitage, Pompidou and The Metropolitan Museum of Art. In 2016 The Musée d’Art Moderne, Paris held a major retrospective of his work.